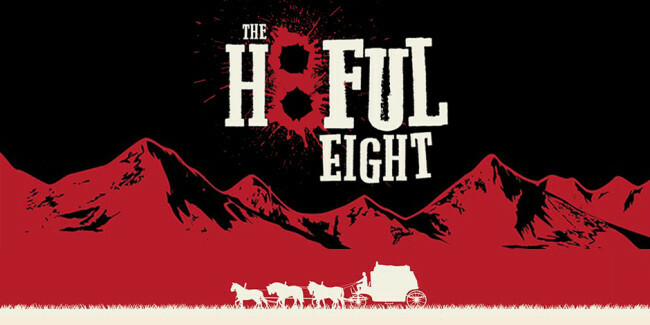 Eight tough customers and one ugly lady holed up in a Wyoming cabin store during a freak blizzard, where once dwelt a lovely & friendly family who have apparently gone on vacation. How did the eight come to be there, what are their motives, and who will make it out alive, those are the pressing questions. John “The Hangman” Ruth, a famous bounty hunter, is bringing Daisy Domergue into Red Rock to hang for unspeakable crimes. Along the way, he welcomes fellow headhunter Marquis Warren into his private stagecoach, as well as newly appointed Sheriff Chris Mannix, the one-time Rebel freedom fighter. They, along with their trusty driver O.B., stop at the country store for protection from the storm. But waiting there are four unsavory & suspicious characters: Joe Gage the cowboy, Bob the Mexican, Oswaldo Mobray the hangman, and General Sandy Smithers the former Southern commander. It’s a deadly game of Clue set in the Wild West, with not one victim, but handfuls. The film began like such a theatrical version of a Tarantino film that I thought, just for a second, that we weren’t about to see ten gallons of blood spilled over the next three hours. As we were introduced to the characters, they each took their places, announced their identities, stated their cases, and began what felt like a comedic murder mystery more than a gruesome Western. And boy was it funny; I don’t think I’ve ever laughed more during a Tarantino film. Some of the humor was physical, some was brutal, some was in-your-face, some was subtle. But the film was so quickly hilarious (after long opening scenes in the snow to build the mood) that I thought perhaps we were in for something a little different. And while different was exactly what we got, Tarantino still delivered his patented violent style, just with a touch more intrigue than we’ve seen from him before. The blood started pumping in the second half, after the story was completely set up. People start dying, SLJ becomes a bit of a Sherlock Holmes, more people die, the plot is fully revealed, and then, yes, more people die. 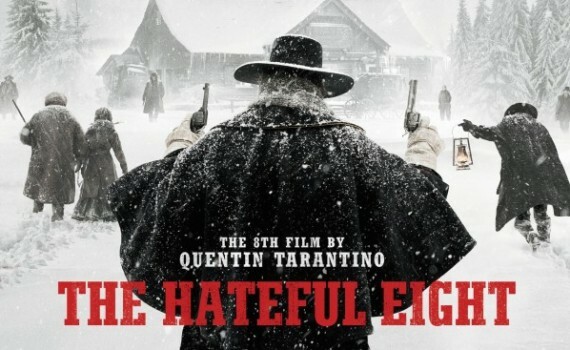 It’s a perfectly bloody, messy, Tarantino-y spectacle that equals the gore of his goriest and the depth of his depthiest. 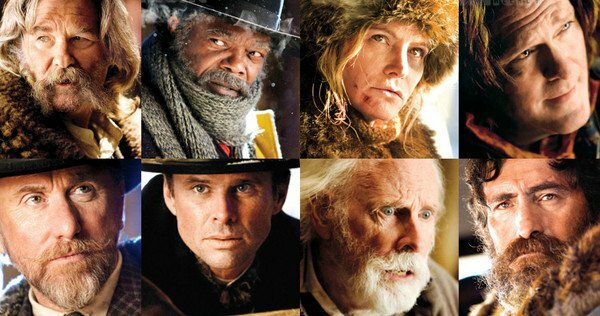 The Hateful Eight is stage drama meets Western meets Reservoir Dogs, with horror gore & comedy laughs thrown in for good measure. A lot perhaps, and that may be why some critics aren’t giving this film what I would call its due, but any director that can make Michael Madsen, Kurt Russell, & Jennifer Jason Leigh look like A-list actors can throw whatever he wants into his movies. The film has amazing characters, a brilliant score, a set I would love to explore, and maybe the best supporting performance of the year from Walton Goggins. What this film lacks is the heart that’s present in Tarantino’s very best (Inglorious Basterds, Django Unchained), or maybe it’s only Christoph Waltz who’s missing, a genius in those two films. But not being perfect only holds it back from being one of the best films I’ve ever seen, keeping it as merely one of the best I’ve seen this year.